As a creative coach, human-centered designer, strategic advisor, and facilitator, Ektaa has spent a decade and a half helping leaders and their organizations around the world, create products, brands, experiences and practices that help with organizational transformation for purpose and people to thrive. Originally from India, Ektaa currently lives and works in New York City where she launched her new start-up –Design Shakti to address the global gap in continuing education for creatives to align with their purpose, and new skills they need to learn to lead more mission-driven lives. Her past experience includes IDEO.Org as Creative Director where she helped set-up their New York studio and worked on designing a reading movement in Syrian refugee camps. While being the creative director at Landor Associates she worked with several Fortune 500 companies to help lead their brand transformation journies from strategy to culture design to service design. 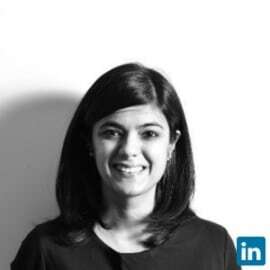 She also helped grow Landor’s offering to digital and was responsible for business expansion across South Asia. Whether it’s designing a new social entrepreneurship program for Google’s 30 Weeks to facilitating teams for creative thinking at Intellecap or a brand transformation project for Mahindra, Ektaa facilitates multi-disciplinary teams to help problem-solve, design and deliver solutions to complex challenges that are not only that are desirable and viable but achieve the desired impact. Some of the diverse brands she has worked on have included Inscape, Intellecap, Love Matters– RNW-Netherlands, Coca-Cola, Mahindra, Vespa, American Express, The Guggenheim Museum, Barista, Tata, House of Anita Dongre, The Park Hotels, Johnson & Johnson and Saks Fifth Avenue.